I can't help but to put this post up as soon as I downloaded my photos. I just can't wait to share this simple dessert with you. 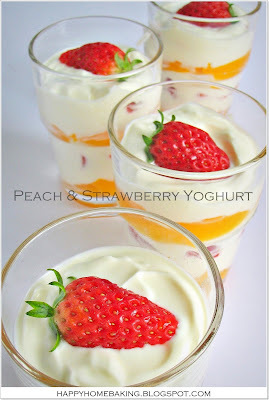 I 'made' these Peach & Strawberry Yoghurt parfaits for our after-dinner dessert the other evening. It is so quick and easy to put this delicious and healthy dessert together. 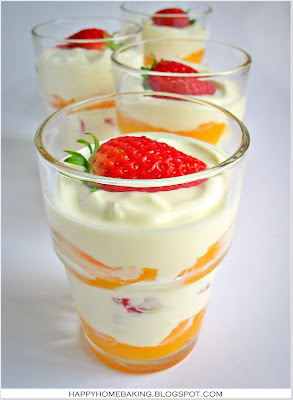 You will only need to layer a glass with some sliced canned peaches, some plain natural yoghurt, some fresh strawberries cut into chunks, another layer of yoghurt, some more peaches, cover with more yoghurt and finally top if off with strawberry (cut into halves). I have been buying punnets after punnets of Korean strawberries lately...they are so fresh and sweet! I have actually planned to use blueberries for this dessert, but the pack of blueberries I bought was soooooo sour. I'm so glad this peach and strawberries combination taste just as good! and who said dessert can't be healthy?!! 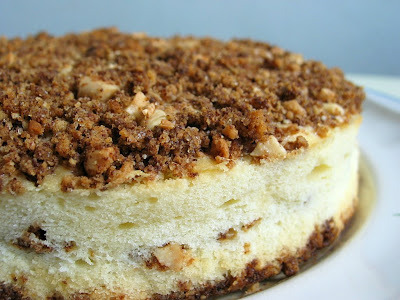 This is def a yummy treat for everyone thats easy and healthy... no hassle! Dummy proof for someone who hardly prepares anything in the kitchen. Tks for the lovely recipe and beautiful pic. 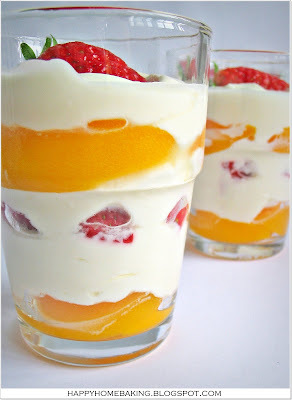 I love simple, healthy desserts like this. These desserts make you feel like you're getting away with something sinful. Plus, strawberries and peaches happen to be two of my favorite fruits! Yum! Wow! gorgeous pictures and such a lovely simple recipe! Yummy! I saw Jamie Oliver preparing a rather similar one last night. Now you've given me an idea of how to use up the greek yogurt! My kids sure love this desserts, thanks for sharing. The pictures look very pretty with lovely color. You are not only good in cookery but also photo shooting! This is my kinda recipe .. easy to put together and easy to find the ingredients too ... perfect recipes for beginners like me. And gosh! They look as if its prepared by the 5-star hotel chef! The picture are soooo cute! Now I'm drolling waiting for the strawberries...it's a way long the spring here!I confort myself with kiwi and banana version or watching your pictures dreaming of warm and sunny days...thanks for the touch of joy of this healthy dessert! No more salad dressing, jam and peanut butter even since I got yoghurt. And I almost give up my favorite ice cream in summer and now yoghurt is a 'must have' in my refrigerator all year around. How beautiful! What a great presentation for something to fresh and simple. You're a genious! Your pictures are simply beautiful and your recipes sound yummy!!! I'm also a stay-at-home mom with 2 kids, looking for women who are sharing their experience with others. My blog is in portuguese, but I'll be visiting yours frequently from now on. Congrats and keep it up! Thanks for sharing. Makes me want to go out now & buy some canned peaches & perhaps blueberries if its still on offer at Fairprice. Tried this yesterday, since I have a can of peach and the 1kg yogurt which is still sitting in my fridge :) Thanks for sharing. My next try would be the chill yogurt dessert - with the vitagen which I just bought from the sales yesterday! 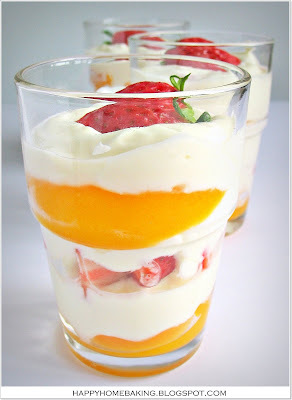 You have made such a simple dessert look soooo nice and yummy, going to try it out tonight since I have some Korean Strawberries with me...yum...can't wait to try. Oh, and you remind me that I need to go get some nice Korean strawberries! I hope NTUC still has them stocked up. So simple and tasteful looking! Fresh and yummy dessert. This is so simple yet looks so elegant! Love it! This looks delicious! And just perfect for the 80 degree weather we're having in Austin! I'll definitely have to keep following this blog! Hi HHB, you made magic by matching the humble yoghurt with glorious fruit! Hi Cookies, I have tried different brands of Korean strawberries, and some of them are not as sweet, they are also much cheaper as compared to two years ago. Wow great work again! I love peach and strawberry! actually i made a peach and raspberry cake (peach melba) & oh my it was heavennnn!! Mmmmmmmm your recpice is so good I am going to make this ever time I have a party!!!!!!!!!!! !